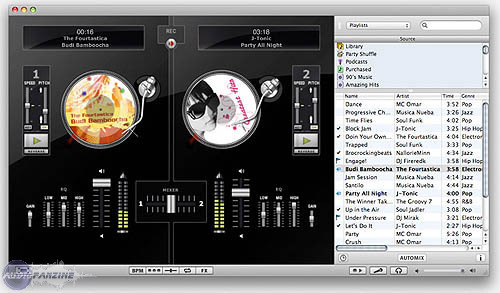 Djay 2, DJ Software from Algoriddim. algoriddim has released version 2.3 of djay, its DJ software for iTunes. The new version now integrates with Nicecast from Rogue Amoeba, allowing users to broadcast their DJ mix online. With Nicecast, djay can be used to broadcast music to all major online radio networks including Live365, Shoutcast and Icecast, according to the company. In addition, djay 2.3 includes a new power button for each turntable, designed to simulate how real turntables gradually slow down the record when being turning off. And a new Auto Select mode for djay's Pre-Cueing feature allows users to automatically listen to one turntable on their headphones while the other is playing through the main speakers. djay is available for $49.99 or €39.99 as a download from the algoriddim website, or as a product box from the Apple Online Store and Apple Retail Stores worldwide. 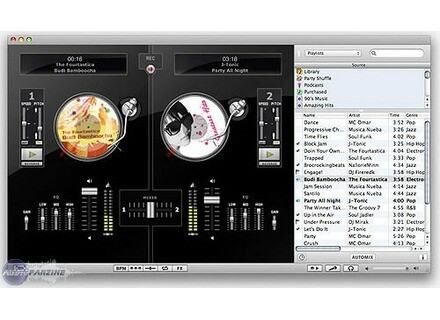 For more information and to download a free demo, visit www.djay-software.com. Nicecast is available for $40 as a download from the Rogue Amoeba website at www.rogueamoeba.com. [NAMM] Denon DN-X1100 D&M Professional & Business Group (Europe) has announced the launch of the new DN-X1100 Professional 4-Channel Matrix Mixer from Denon DJ. [NAMM] Denon DN-S3700 Digital Turntable Denon DJ recently introduced its new DN-S3700 Digital Media Turntable at NAMM 2009.